This piece was written for All About Beer magazine in 1995. Remember “gusto”? Can you recall the time in America when a voice from the clouds told you to “go for it”? Alas, the era of gusto seems as distant and faded as a tintype. Today, you can’t even drink beer on a television commercial. We can only watch the pouring of beer followed by suggestively empty glasses, with nary an on-screen sip in between. Imagine then how heartening it must be for a weary traveler to land in Tokyo, bleary-eyed in the Land of the Rising Sun, and discover that gusto lives in Japan. Yes, the land of ancestor worship and cultural assimilation has gathered gusto unto itself and given it a whole new life. Check in, drop your bags at the foot of the bed, turn on the TV and see an enthusiastic young man gulping beer, visibly and very audibly, head thrown back, tilting the screen. In one long, unapologetic pull he drains the contents, then spins to face the viewer, flashes a grin and lets loose an ‘ahhhh’ of satisfaction that sounds like the roar of a crowd at the bottom of the ninth with two out and two on. That’s gusto! Ready for some gusto of your own? Step out into the sprawl of Tokyo for a beer at a neighborhood izakaya. You know the izakaya is open when the flags fly over the doorway. The one you’ve chosen is small, with a bar in the front half. Walk through to the next doorway, drop off your shoes and take three steps up to a room with low tables and tatami mats on the floor. Inhale deeply. That reedy, green smell is tatami. It’s a natural material, and nature is everywhere in Japan. Your waitress bows and murmurs greetings in tones so soft that you think they are being borne on a passing breeze. With the complimentary appetizer, something small from the ocean in a delicate porcelain cup, you are served a very tall glass of beer. As Japanese cuisine strives to be sappari — clean, light, sparkling with honesty — so does their beer. Most of it is lager, made exclusively with two-row malt and sometimes rice as an adjunct. No six-row, no corn. It is lightly hopped, fresh and refreshing, and shown to an advantage in the izakaya setting. To go for the gusto, accompany your beer with the specialty of the house, perhaps fried squid, octopus, or sticks of chicken yakitori, perhaps even an order of French fries. Yes, even in Japan they ask you if you want fries with that. Do not, however, seek a similar experience in Rappongi, the Tokyo district to which homesick westerners flock for comfort. At the Hard Rock Cafe, an anemic 12-ounce can of American beer is ¥800, about $9. This is not gusto. This is American servicemen soaking up the music and familiarity, tourists picking up t-shirts, British businessmen smoking, and young men flirting with young women whose husbands are half the world away. The next day, you may feel the need for some gusto on your way to whatever cultural landmark you’re visiting. In grocery or convenience stores (like those of the cordially named “Nice Nice” chain), you will find a variety of beers with exquisite labels. Don’t be alarmed if no one appears to be watching the store. They aren’t. No one steals. Use your time alone to review the labels and graphics, which make their American counterparts look like mattress tags. To be sure, the American label is a tight little billboard built for pulling power on the shelf. But it lacks the subtle beauty that distinguishes many Japanese efforts. And when you think of ‘subtle,’ remember that the Japanese have been known to listen to snow flakes. Their beauty is not confined to museums; it is everywhere, especially in everyday objects. More than a container, a beer can is an occasion for visual pleasure, and a reflection of the beauty of the natural creation within. Perhaps you’re headed for the sumo matches at Tokyo’s Kokugikan Hall. If you’re lucky or early enough (say 6 a.m.) to get tickets, you’ll find that all the seats are good seats. Hit the concession stands for sumo souvenirs, boxes of yakitori chicken, cold tall-cans of Sapporo and Suntory, or cans of sake with a cool sumo label if you’re so inclined. Then spend the day drinking and eating, and watching big guys who train by wrestling all morning, downing lots of beer at lunch and then taking a long nap before stepping out for a snack and some night life. That’s gusto! To see where all the beer comes from, tour a major brewery. The Sapporo Brewing Company has a beauty in nearby Chiba, on the waters of Tokyo Bay, surrounded by 101 palm trees and vistas of the sea. It’s a huge, modern structure with uniformed guides who sweetly humanize the architecture as you step in the door. The tour begins in the movie theater with a wide-screen history of beer. In keeping with the Japanese respect for tradition, the film traces beer from its beginnings in ancient Mesopotamia and Egypt, through its flowering in Germany. The mammoth screen offers you a dizzying panorama of Neuschwanstein, Mad King Ludwig’s castle, and takes you on a tour of a German brewery before bringing you back to Japan. The walking tour takes you through the modern plant with its polished stainless steel brew kettles and a gallery of Sapporo advertising posters dating from the late 1800’s framed along the hallways. Take the morning tour and you’ll be in the tasting room by 11:30 a.m., enjoying Sapporo Draft and crackers made with yeast from the fermentation tanks. It isn’t even lunch time yet, but no one bats an eye as the beers arrive. To round out the experience back in Tokyo proper, stop by the Beer Museum at Sapporo’s headquarters in Yebisu. Tour the “Virtual Brewery,” a computer-animated experience where you peer into goggles, pass through brick walls, glass windows and steel tank walls, and shrink to the size of a yeast cell, to watch and listen as your fellows swim, grow and ferment the beer. There is another tasting room, naturally, and this one features an extraordinary collection of antique tankards and steins, in pewter, porcelain, even wood. Try the Black Beer, Japan’s only unique beer style; it has the body of a creamy lager but the deep color and roasted flavor of a stout. Finally, the Japanese gift for assimilation and reverence for tradition come together with the most amazing results at the Lion Beer Hall in the Ginza district of Tokyo. Built in 1934, the Lion is a trip through the looking glass. In the style of a German beer hall, the main floor of the Lion is a single large room with high, arched ceilings, broad pillars and peaked rafters. 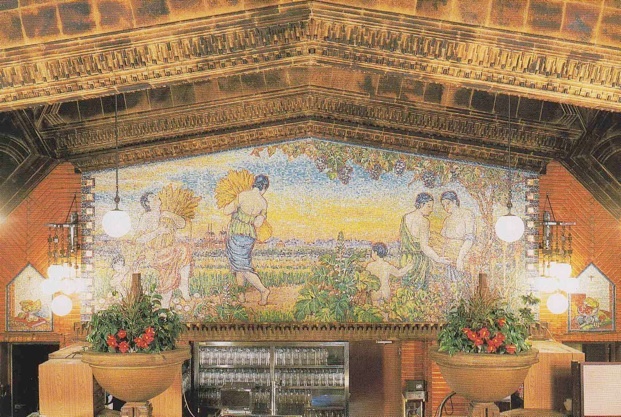 The pillars and ceiling are tiled in green and brown, and small mosaics are set in alcoves along the side walls. The heart of the Lion is a vast mural that dominates the far end of the room. It depicts women in togas, draped and undraped, out in the fields gathering sheaves of grain. The sun glows on the horizon and a lush grape arbor frames the scene. It is quite spectacular. All of the mosaics and the building itself were designed by Eizo Sagurawa. The artist, although Japanese, was obviously influenced by the European traditions of the time, and used intense colors that owe much to post-Impressionists like Matisse and Van Gogh. After the swift headwaiter shows you to a table, sit and listen to the accordion music ringing off the tiles. Gaze admiringly at the Japanese waitresses in dirndls. Look for other dazed westerners whose faces scream, “Where the hell am I?” To accelerate the cultural carousel, share your table, as other visitors have done, with Japanese matrons who are eating pizza. With chopsticks. You can blink, but they will still be there. A Japanese saying holds that if you eat something you have not tasted before, your life will be lengthened by 75 days. So do not be surprised if the matrons follow the pizza with Wiener Schnitzel; it is excellent, especially when accompanied by the slightly sweet Sapporo Dunkel, or Yebisu, an all-malt lager that is rich and smooth with a nice hint of alcohol in the finish. Before you leave, take a peek at the upper floors, smaller rooms with different themes, and, also like a recent visitor, you might see a man passed out but still standing, propped up between a pillar and a cigarette machine. So polite. You will feel remarkably safe on the streets of Japan, and statistics reveal the reasons why. Robberies number less than 2 per 100,000 people in Japan, while in the U.S., the number is 255. Japan had 38 murders by firearms last year. In the U.S., with just over twice Japan’s population, the number was 16,189. After the recent Kobe earthquake, there was no looting. Laid end to end, American excuses for looting would circle the globe, or at least the nearest WalMart. And so it goes. In the final analysis, gusto flourishes in Japan because it can. The nation’s deeply held sense of social responsibility is such that even when under the influence, people behave. And even when incapacitated, they are safe from harm. The inner discipline of the Japanese makes outer discipline unnecessary, and allows them to go for it. An island nation, Japan has either welcomed ideas from the outside or shut them out entirely. During periods of openness, the Japanese chose those things they found to be especially attractive or useful. In their centuries of withdrawal, they blended the new ideas with their own culture. Portuguese traders and missionaries first opened Japan to the west in the 1540’s. The Japanese found the foreigners boorish, but they did bring in new technology and lucrative trade. But when a boisterous sea captain boasted to the shogun that western nations needed no military to conquer Japan — they prevailed by sending priests to convert and subvert the people — the westerners were tossed out on their collective ear. By 1638, they were all gone and remained so for 200 years. All but the Dutch. The Japanese found the Dutch to be the quietest and the least dangerous of the lot. So once every six months, a Dutch merchant ship was allowed to land cargo on the island of Deshima. And once a year, the head of the trading mission was allowed to set foot on the mainland and journey to Tokyo to pay ceremonial homage to the shogun, bearing gifts and a humble attitude. Some say that these Dutch traders introduced beer to Japan, and others insist that the introductions were made when Commodore Perry arrived in 1853. Once full scale trade began, however, German beer soon became the leading import. In 1869 or 1870 (accounts differ), a brewery owned by American interests was built in Yokohama to test the market for a locally brewed beer. To stimulate the native industry, the Japanese sent a young man named Seibei Nakagawa to Germany in 1873 to study the craft and bring back the know-how. In 1876, Nakagawa returned and designed a brewery which was built in Sapporo by the government of Hokkaido, to provide a market for the barley being grown on the island. The Sapporo Brewery was Japan’s first Japanese brewery, and passed into private hands in 1886. The Osaka Beer Brewing Company was founded in 1882 and eventually took the name of its leading beer, Asahi, which went on sale in 1892. The Japan Brewery Company was founded in 1885, its plant built in 1887 and its beer, Kirin, was on the market in 1888. But the company also acquired the early American brewery, which today gives them reason to claim they are Japan’s oldest brewery, or at least descended from it. Suntory entered the beer market in 1963, and today these four brewers dominate the marketplace.